I have considered myself a fan of Mike Knowles since I read his first book in his incredible Wilson series. His writing is well-plotted and well-researched, leading to captivating books which are meticulous in details and richness. I was excited to see his latest book, Tin Men, was a departure from the Wilson series, as I was interested to see how he could handle creating new characters and new plots. 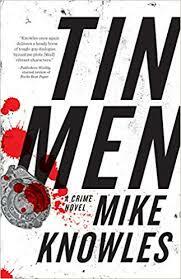 Tin Men differs from the Wilson series a great deal. The biggest difference is the changing from crime novel to a police procedural. I tend to read many crime novels but few police procedurals, as I find the point of view of the criminal more entertaining and more noirish. However, Knowles has crafted a procedural in which the detectives are straddling the thin line between cops and crooks. This balancing act led to a book which hooked me from the beginning and held my attention until the very last page. The plot is an engaging one; a female cop is found brutally murdered within her home and her unborn fetus removed from her womb. The cops assigned to investigate the crime all bring personal baggage to the case. There is Os, a brutish cop who is not squeamish about using brutal methods to avenge victims and seeks justice by all means necessary. He also happens to be the father of the missing baby, but he keeps this fact close to the vest. His partner is Woody, a cop looking to avenge the death of one of his fellow officers, but also the man struggling to put the ghosts of his dead wife and child to rest within his heart and his mind. His reliance on illegal drugs is not making it any easier to quiet the voices in his head, nor is it helping him in his quest for justice in this case. The outsider in the investigation is Dennis, a cop who is always on the outside circle from the others in blue. He is full of bravado, but his colleagues see him as a lazy outsider who doesn’t deserve respect or accolades for his accomplishments. Dennis believes this might be the case which forces those around him to afford him respect. This book is a hell of a page turner and deserves a wide audience. Knowles juggles the multiple plot lines and points of view with mastery and ease. Each plot thread propels the story forward and brings it to a satisfying climax. Knowles is certainly an author you should seek out.